"The African Bird Of Prey Sanctuary"
The African Bird of Prey Sanctuary is dedicated to the conservation of indigenous raptors and is base to ongoing research, breeding and rehabilitation projects for birds of prey. The majority of these projects run ‘behind the scenes’ to ensure that the integrity of the wild birds is not compromised and that a high release success rate is achieved. The sanctuary is, however, also home to a wide selection of captive-bred or ‘non-releasable rehabilitation’ birds of prey. These raptors can be viewed in their ‘micro-environment’ enclosures by anyone who wishes to visit and learn about South Africa’s magnificent aerial predators. Education and awareness is paramount to the effective conservation of our environment and its creatures. To facilitate this, a specially trained group of raptors are flown in daily flight displays. These demonstrations allow the raptors themselves to become both teachers and ambassadors for their wild counterparts, so that members of the public can experience these normally rare and elusive birds first hand. The shows are daily at 10.30am (except Mondays) and 10.30am and 3pm on week-ends. Entrance fees are R40.00 for adults and R25.00 for children. Found on the Lion Park road in KZN, the African Bird of Prey Sanctuary opened quietly in June 2006, but is an amalgamation or a variety of projects that have been ongoing for that last five years in KZN. The sanctuary is headed up by husband and wife team, Ben and Shannon Hoffman and cares for over 180 different birds of prey of 50 different species. 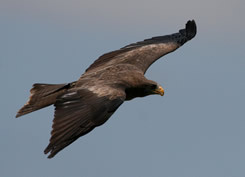 Biologist Ben Hoffman has been actively working with birds of prey both in South Africa and Zimbabwe for over 25 years. He specializes in raptor rehabilitation and handles over 100 cases annually. He has also to date successfully bred 15 species of birds of prey, many of which are released back into the wild. Raptor trainer, Shannon Hoffman has been working fulltime with birds of prey for the last seven years, both in South Africa and abroad, and handles the education and public awareness side of the business. Over 20 thousand people have so far witnessed first-hand the birds of prey in action. Partnering this project is the Mayibuye community, who owns the land on which the sanctuary is built and shares a percentage of all gate takings. 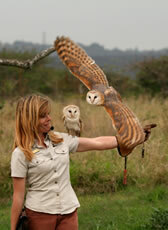 The centre is also base to the African Raptor Trust (No. IT 1467/2005), of which the specialist rehabilitation facility ‘Raptor Rescue’ is currently the primary working group.